The holiday season, it appears, Is upon us. This year I have a bit more time around the holidays so I wanted to take a moment to talk about our favorite Christmas Beverage Rum Wassail! Yes, Wassail, which no two medieval beverage scholars can agree upon because they all think it’s the same product. Heated wine, mead, cider and or beer served with various spices, slices of lemons and oranges in a double handled silver bowl that people either drink directly from or get ladled out a glass/cup of to enjoy before going out in the snow and singing at someone else’s door for another glass of what sounds utterly vile. Romans would most likely have been the source of this beverage. They had wine, beer, mead and cider easily available as one of the first civilizations to cultivate apples and it’s mentioned by Pliny the Elder in some of his writings about a spiced beverage served near the Saturnalia season. So is it Apple Cider, Mead, Beer or Wine? And to that I say “Yes”. Remember the Beer/Wine Line that runs slightly above France but Below England across Europe to Moldova. If you’re above this line, most likely your Wassail was made with either Beer or Apple cider. Below this line predominately wine. However, Mead is equal opportunity. 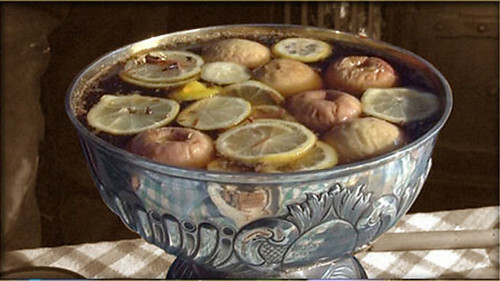 The drink has actually been described by several individuals and in each case a different alcohol (probably whatever was readily available) was the base and fruit was added and the whole mixture heated. Wassail’s first mention is as ‘lambswool’ drunk in Shakespeare’s time which was mead heated to boiling and then crabapples dropped in which would immediately burst (subsequently I surmise dunking for apples may have come from this same concoction). In the 17th century Gerard’s Herbal described it as warmed spiced ale or cider with toasted bread and “crabs” (crabapples) floating in it. Sometimes eggs or crème were added and the mixture became more of a sauce for fruitbreads or cakes. Later in the 1800’s, In a Christmas Story by Charles Dickens; Scrooge offers Cratchett a glass of Smoking Bishop which is a similar kind of beverage and moves back to the wine like beverage with spices and sliced fruit in it.